The group combines elements of R&B, pop, soul and beatboxing, using only their voices as instruments in an a cappella experience like you have never heard before; a full band sound with drums, bass, guitar, keyboards, harmonica, horns and breathtaking harmonies with nothing but the organic qualities of the human voice. The band’s impressive credentials also include recording with Quincy Jones and Ludacris, appearing on Ellen and The View, achieving three top 10 US AC singles and hitting 20+ million YouTube views worldwide. Naturally 7 has a global following with signature tunes including ‘In the Air Tonight’ and their stunning version of Coldplay’s ‘Fix You’ making it one of the world’s most popular vocal groups, carrying the spirit of artists like Boyz II Men, Jodeci, OutKast, The Four Tops and Bobby McFerrin. As World Vision artist partners, Naturally 7 will first travel to Cambodia to visit projects that address the root causes of poverty for local children, their families and communities. The band will visit schools to engage children in music; learn about a new project that uses phonics to improve literacy rates in schools; and see how children are learning about improved nutrition, water and sanitation, so they can then teach their own families and communities. World Vision’s Vision Artists Manager Michael Bianchi said Naturally 7 embodied the ideal artist partner for World Vision and their tours. This spring, Naturally 7 is set to delight new and existing audiences alike with an unforgettable evening of soulful music. 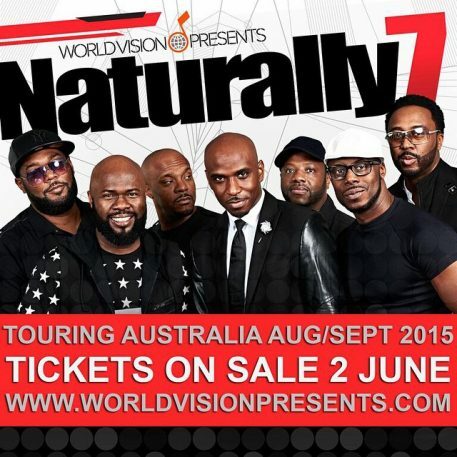 Don’t miss out on this opportunity to hear Naturally 7 live – this is one concert that will have Australia talking. Naturally 7’s new album ‘Hidden in Plain Sight’ is out now on iTunes, Spotify, Rdio and more. Tickets for Naturally 7’s 2015 tour are on sale from 10am June 2. *Tour dates, cities and venues subject to change without notice. Naturally 7 combine elements of R&B, Pop and beatboxing using only their voices as instruments coining their unique sound as ‘vocal play’. This spring, Naturally 7 are set to delight new and existing audiences alike with an unforgettable evening of soulful music. This entry was posted in News, Press and tagged Adelaide, Australia, Brisbane, Cambodia, Canberra, Melbourne, Newcastle, Perth, Sydney, Tour, World Vision. Bookmark the permalink.